Big Mouth House, 9781931520300, 258pp. In 1960, thirteen-year-old Sophie slips through a maze into 19th century Louisiana and finds nothing is as she expected. 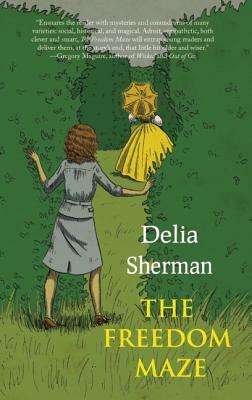 Delia Sherman is the author of two middle grade novels, "Changeling" and "The Magic Mirror of the Mermaid Queen," which was selected for the Sunshine State Young Reader's Award Program. Her short stories for younger readers have appeared in numerous anthologies including "The Faery Reel, Firebirds, Troll's Eye View, Coyote Road, " and "A Wolf at the Door." She is also the author of a number of novels for adults as well as the co-editor of two Interfictions anthologies, among others. Delia Sherman lives in NYC and is available to give readings, school and library visits, and teach workshops. "Multilayered, compassionate and thought-provoking, a timely read on the sesquicentennial of America’s Civil War." "Sherman has created a finely honed work of art, a novel that deals eloquently with complex and intersecting issues of race, womanhood, class and age. In transporting the reader so fully into another time, The Freedom Maze becomes timeless." "A seamless blending of wondrous American myth with harsh American reality, as befits young Sophie's coming-of-age. I think younger readers and adults alike will be completely riveted by her magical journey into her own family's double-edged past." "Beautifully imagined and told with satisfyingly matter-of-fact detail: pot liquor and spoon bread, whips and Spanish Moss, corset covers and vévés and bitter, healing herbs. The Freedom Maze is deep, meaningful fun." "Exposes a wide sweep through a narrow aperture, where the arbitrary nature of race and ownership, kindred and love, are illuminated in the harsh seeking glare of an adolescent's coming of age." "This book puts the lie to those today making loose political statements about happy, comfortable slave families of that brutal era while telling a strong story that will not let the young reader stop turning pages to see how things will work out for Sophie and her fellow slaves, especially the cook Africa, and house slaves Antigua and Canada. I was mesmerized." "A riveting, fearless, and masterful novel. I loved Sophie completely." "A subtle and haunting book that examines what it means to be who we are." "Vividly realized and saturated with feeling." "Elegantly unravels many myths of the antebellum South, highlighting the resistance of the enslaved, and showing how even the kind hearted are corrupted by their exploitation of their fellow human beings." "A story that says what no story has quite said before, and says it perfectly." "A dramatic yet sensitively-written coming-of-age story that succeeds both as classic fantasy and issue-oriented children's literature." "Vivid and compelling, The Freedom Maze will transport you completely to another time."